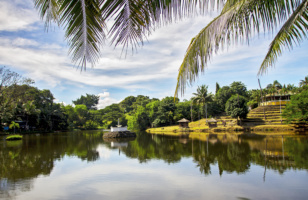 The origin of the name "Muntinlupa" came from at least three versions. First, its association with the thin top soil in the area thus the term Muntinlupa. Second, residents, purportedly replying to a question by Spaniards in the 16th century what the name of their place was, said Monte sa Lupa apparently mistaking the question for what card game they were playing. Third, the topographical nature of the area, where the term Monte or mountain was expanded to Muntinlupa or mountain land. 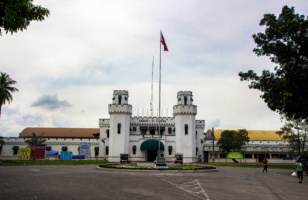 Some documents suggest that the first and third versions of Muntinlupa and Monte sa Lupa respectively eventually became Muntinlupa either through misspelling or mispronunciation. But no record to date can firmly establish which of the three versions is historically correct. Muntinlupa is an old term, which refers to a village now known as the Poblacion. As early as 1800, the Catholic priest Father Joaquin de Zuniga chronicled it as La Poblacion que Sigue se Llama Muntinlupa. As early as 1601, Muntinlupa was under the religious supervision of the Augustinians. 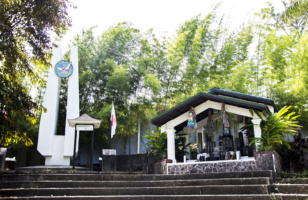 The religious education of the residents was under the convent of the Guadalupe Sanctuary until one Quijano Bustamante bought from the residents the land of Muntinlupa. In 1869, the project of forming a town out of the barrios of Muntinlupa was approved by the Civil Government. In 1901, Muntinlupa was one of the districts of Morong. On November 25, 1903, by Act 1008 of the Philippine Commission, the Municipality of Muntinlupa was included within the boundary of Laguna Province and placed under Binan along with San Pedro. Muntinlupa protested against this Act, through Marcelo Fresnedi, the head of the Municipality. A petition, presented to the Governor General for the return of Muntinlupa to Rizal Province, was heard and granted through Act 1308 and duly approved on March 22, 1905. Muntinlupa was returned to Rizal and became, with Pateros, a part of Taguig from which it was eventually separated because of its physical distance. The residents later petitioned the government for an independent status of the Municipality which was granted under Executive Order 108 dated December 19, 1917 with the approval of Governor General Francis Burton Harrison and took effect on January 1, 1918. Vidal Joaquin, a native of Alabang, served as the first appointed mayor in 1918 while the first elected mayor was Melencio Espeleta. After the 1945 World War, infrastructure projects were implemented in the town. 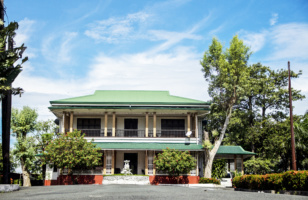 The first municipal hall was constructed under the leadership of Mayor Francisco de Mesa. There was an increase in the rise of residential housing, factories and other business establishments. Portions of the town s 4,673 hectare land area (mostly land farms) were developed. Road widening and development projects were also undertaken by the local government. 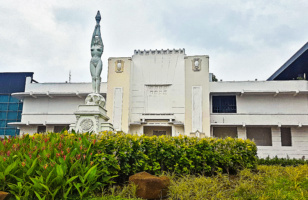 With the creation of the Metropolitan Manila Commission, Muntinlupa was proclaimed on November 7, 1975 as one of the 17 municipalities and cities comprising the Metro Manila area. Under the Loresca and Argana administration, education was given priority. Elementary public schools at different barangays were established. After the EDSA revolution, lawyer Ignacio R. Bunye was appointed mayor of the municipality by President Corazon Aquino. He served the local government for three consecutive terms and the administration undertook various projects that converted the municipality into a very progressive town in the far south. With the ratification of the 1986 Constitution, Muntinlupa together with Las Pinas formed one political district. Muntinlupa was divided into two districts. District I included Barangays Tunasan, Poblacion, Putatan and Bayanan while Distric II consisted of Barangays Alabang, Cupang, Buli, Sucat and New Alabang. During the Bunye Adminstration, Muntinlupa signed a sisterhood pact with Gunma, Japan. 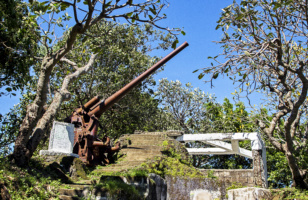 The covenant called the Muntinlupa-Gunma Sisterhood Pact that will establish bilateral relations between the two municipalities was signed on March 1, 1994. On February 16, 1995, House Bill No. 14401 converting the Municipality of Muntinlupa into a highly urbanized city was approved by the House of Representatives. Muntinlupa formally became a charter city when President Fidel Ramos signed Republic Act 7926 proclaiming Muntinlupa as a city. Bunye became the first representative of Muntinlupa City in Congress. Designed by Manuel Amorsolo, son of a national artist, the City Seal features the Philippine Eagle – the biggest, the strongest and the highest flying bird of the Philippine Republic – a bird that symbolizes our dream, one day, to make Muntinlupa one of the leading investment hubs in the country. 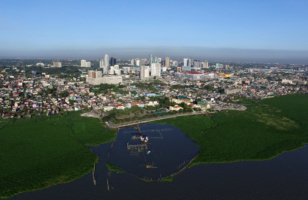 We envision Muntinlupa City as one of the leading investment hubs in the country, with educated, healthy and God-loving people living peacefully and securely in a climate change-adaptive and disaster-resilient community, under the rule of transparent, caring and accountable leadership. To institutionalize community participation in local governance, environmental protection, and economic development.